We are a money making blog and we love to teach other female entrepreneurs the exact steps to take on how to make a full-time income from your blog. If your goal is to monetize your blog then this post is for you. Blogging is definitely not a get rich fast kind of gig, but you can absolutely make money blogging if you put your mind to it. With the right strategies, a great goal and some work, you can start earning a full-time income from your blog sooner than later. 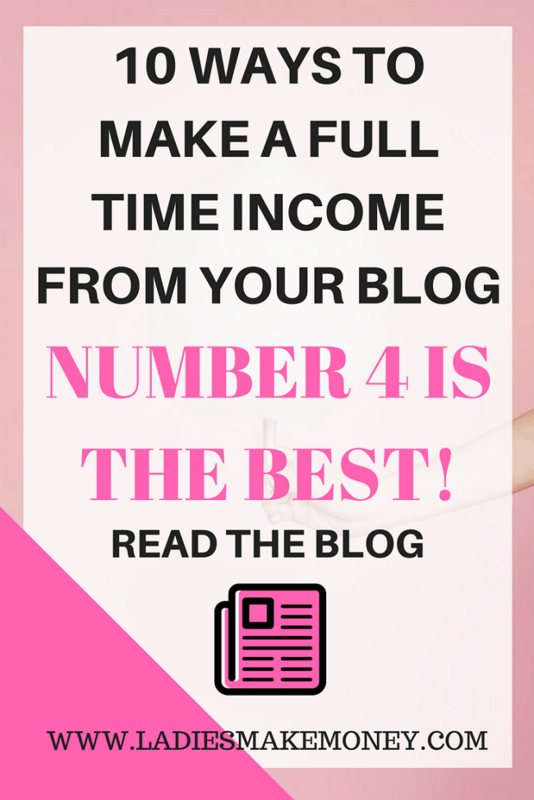 Here are 10 ways to make a full-time income from your blog starting right now! This blog post is not a guarantee that you will start to make thousands of dollars on your blog tomorrow or the next day. We hope that you can put in the work, create a solid plan and set some actionable and achievable goals for your own online business. The harder you work, the more money you can make with your blog. Bloggers that are making thousands of dollars per month are working extremely hard and it was definitely not an overnight success. You can take a look at a few blog income report here to help better understand how do bloggers make money online. 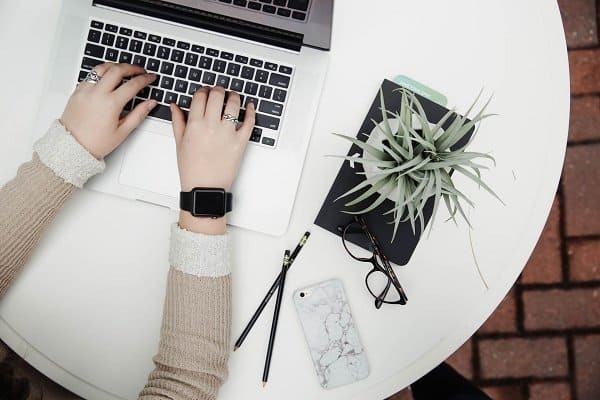 If you want to start earning a full-time income from your blog, be sure to check out our network of other bloggers helping each other slay blogging goals every day. Note: You can now sign up for my free How to start and launch a successful blog course here. 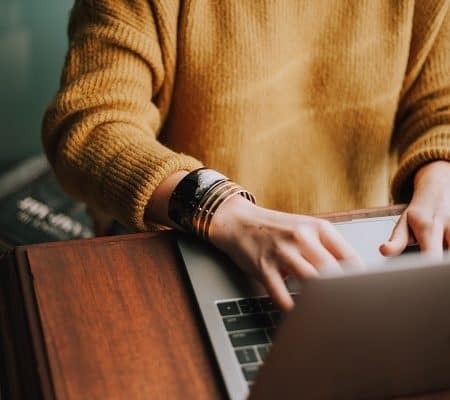 We walk you through the step by step guide to setting up a blog and monetizing it so you can make a full-time income from your blog. Want to make money blogging? Start creating quality posts that resonate with your readers. Content is king and creating frequent and quality content for your readers will ensure the readers keep coming back for more. My blogging schedule is posting twice a week and emailing my subscribers weekly. The first step you must take is to ensure you have a plan to stay consistent. Creating a solid content calendar and sticking to it will help you in the long run in terms of making money with a blog. 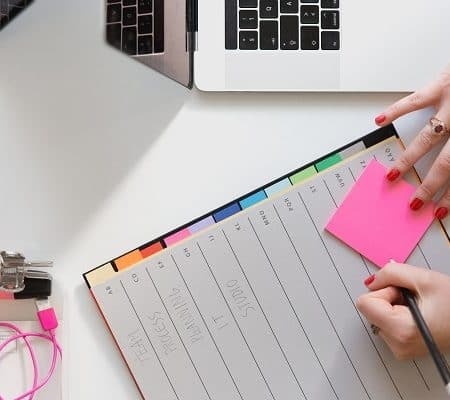 I really love this post that Neil Patel wrote on how to create a content calendar that will streamline your content strategy. The content you create should be helpful for your readers as well as packed with value. Otherwise, you will not secure return readers. The more content you create the more you will attract readers that will turn into subscribers, it will attract potential buyers and trustworthy fans. Only then will you be able to earn a full-time income from your blog. Utilize social media to reach bigger audiences so that you can get your blog in front of more readers every day. Make it your mission to connect with new fellow bloggers in your niche every week. 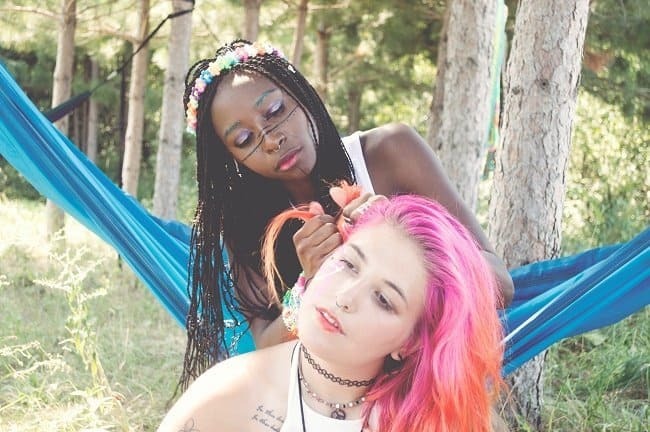 If you are a beauty blogger, connect with hair salons, other makeup artists, and clients on a weekly basis. You may want to join Facebook groups as a way to make more connections in your niche. Guest blogging on other bloggers sites to expand your reach is a crucial step to authentically growing your blog reach. My blogging friend Eden Fried has an amazing post “How to Guest post like a total pro“. Reaching new audiences will ensure you earn a full-time income from your blog. Promote your work on social media frequently to reach more potential readers and buyers. 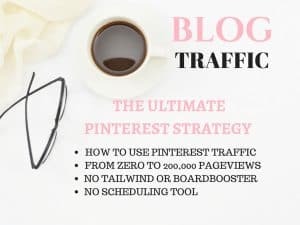 New posts should be tweeted out at least 5 times on the day you publish, re-pinned on all Pinterest groups and your own groups as well as promoted on Instagram, Maven, Facebook groups and Pinterest Tribes. Maven is a new platform that makes me money every week. Join here for FREE and include your Blog link for more opportunities and exposure. Promote and market your blog like your life depended on it to make money blogging. Don’t just create great content and let it sit in your archive. Promote it frequently! Not only on social media but they are so many ways to market your blog. Social media is just one of them. If you do not have an email list, start building an engaged email list to market your work too. If you want to make money blogging you need to think more than just writing blogs day in, day out. You need to market, go out and find your raving fans and secure the, on your email list. If you are looking for a way to make a full-time income from your blog, you should consider starting a side hustle. A side hustle is a way to earn extra money outside your full-time job and even outside your blog. This way, you can pay for any blogging expenses that may come up. They are so many things you can do to make extra money working from home that will help you. We have a few amazing posts below full of creative ways you can make money from home on the side. The one step that will definitely ensure you make money blogging is to get yourself organized. 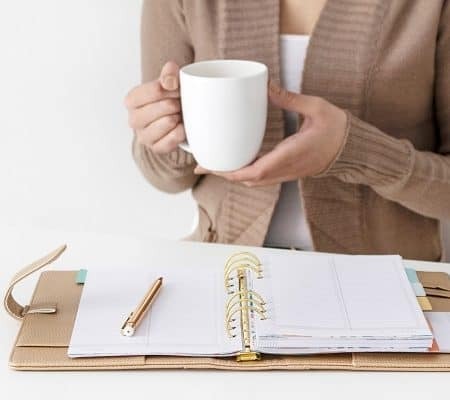 This means creating a full blogging plan for your online business with a list of topics you will blog about each month, how you will promote it, the steps you will take to reach your short and long-term goals. A very organized blogger is a successful one. That is why we created a FREE blog planner that you can download to get yourself organized. We also created a helpful month subscription called Blogging for Profit which will help you grow your blog t the potential it needs to be. Consider creating your own digital products or services to offer clients as a way to make money blogging. This is my favorite way of monetizing our blog. You can make some serious money by offering products that you yourself have created and promoted. I have a few popular products that I offer my blogging team. One is an affordable monthly subscription with monthly updated tips for creating a blog that makes money. It’s called Blogging for Profit. My other course is “From Hobby to Biz“, a blogging course created to help you make money from your blog in the next 60 days. You can definitely make money blogging by creating and selling your own products. 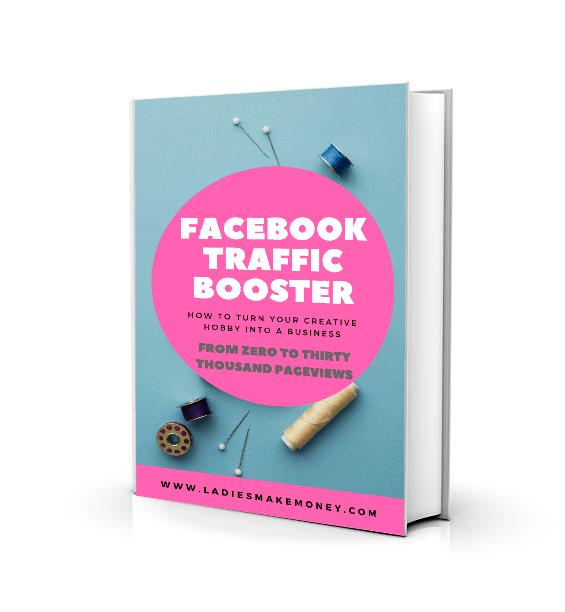 And if you are wondering how to increase your blog traffic then this is for you: “How to get over 30,000 page views using Facebook“. Don’t forget to join our Facebook Group to share your awesome products with the rest of the group: Facebook group! Working with brands is another way of making a full-time income from your blog and it is one of the best ways to make money blogging. Bloggers are making over $2000-$3000 per month just by working with brands. Check out ou Alexis from Fitnancials has managed to make over $3,000 per month with a blog that is less than one year. She is definitely killing it by making money working with brands. If you want to make money blogging by working with brands, ensure you work with brands that are in your niche. Don’t accept sponsored blog posts just for the sake of it otherwise, your blog will be out of commission fast than you think. Create a following on social media, post consistently as we mentioned above and work on a media kit to attract brands that match your blog. Consider applying for Linqia, IZEA and Massive Way as a way to find work. Affiliate marketing is the easiest way to monetize any blog. If you really want to make money from your blog, then you should consider using affiliate marketing. This is when you earn a commission for every sale you make when someone clicks on your link and purchases an item. If you want a way to increase your affiliate income, then read this post! 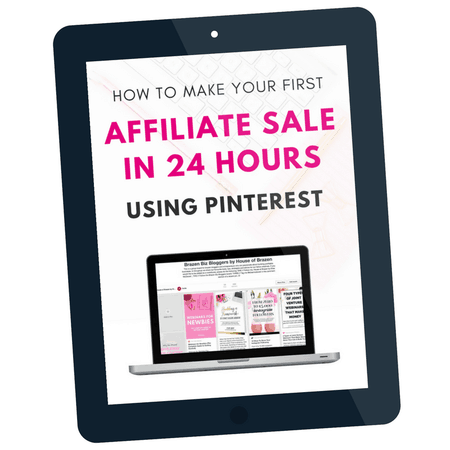 If you really want to succeed with Affiliate marketing I would recommend the following courses and eBooks: “Making sense of affiliate marketing” and “How to make your first affiliate in 24 hours with Pinterest!” These two tools have been instrumental in growing my affiliate sales! Building an email list is crucial to taking your blog to the next level. Most bloggers say that 0.02% of your list usually convert into buyers. If you have an engaged email list of 1000 people, this means about 20 people will purchase what you are selling, signing up for something you are promoting or becoming regular fans. If you have a product that you are selling for $97 this means you could potentially make $1, 940.00. Can you imagine if you have 10 times that list? That’s why I make it a priority to grow my email list. The tools that make it easy for me to grow my list and stay in touch with my subscribers are Leadpages and Convert Kit! If you are not sure how to get your next 1000 email subscribers, our eBook will guide you! If your blog is not set up for success then you won’t go far. This means: if your blog is not properly branded or if you are not collecting emails, not using SEO or if you are not targeting the right audience. A lot of people struggle with creating a successful blog and are not usually sure of what steps to take next. 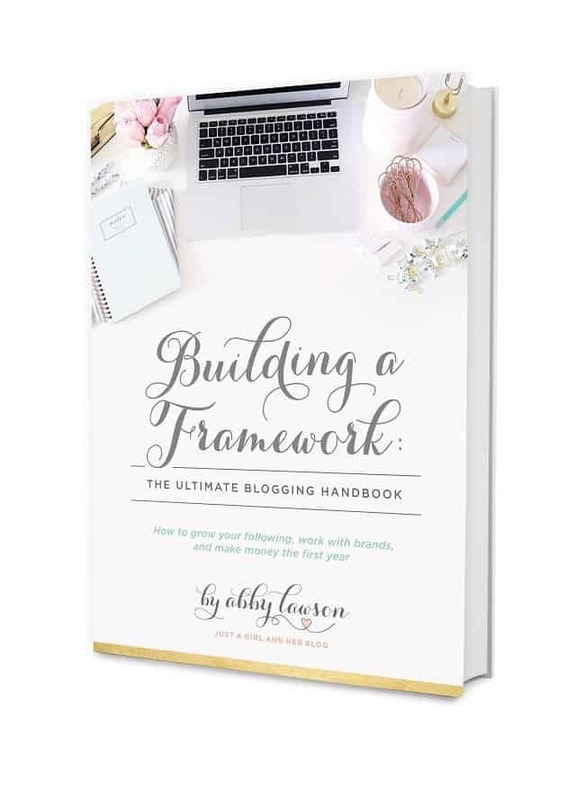 Abby from Just a girl and her blog has an amazing course you can take that will help you out! You can read all about it here! Alternatively, you can join my online monthly subscription course, where we focus on bringing you new tips on making money with your blog. If you want to learn more about how I optimize my blog posts for proper SEO, how I am able to make thousands of dollars by crafting one blog post and many hacks on taking your blog from a zero dollar blog to a profiting blog then the course is for you. Starting at only $25, you will be able to make that money back in no time. I am in love with the program I created for my fans, as I know you can absolutely make money with your blog in no time. You can join us here. Now that we have given you 10 amazing ways to make a full-time income from your blog, what will be your next move? Tell us in the comments below. Lot’s of people wonder, how do bloggers make money? The fact is, you must use different streams to see what works for you. Never put all your eggs in one basket and expect results. You can join our community of tribes that ensure you are making money with your blog right here. Or you can join our main course “From Hobby to Biz” and transfer your blog into a money-making machine sooner than later. Don’t forget to pin this post to your blogging tips today. Next Article Next post: When should you start Monetizing your blog as a business? Great Post! I’ve been attempting to step into the monetization world, and when you see it all broken down into steps it makes it seem less scary. I’m currently trying to be consistent with my posting schedule which is definitely key! Oh very nice. 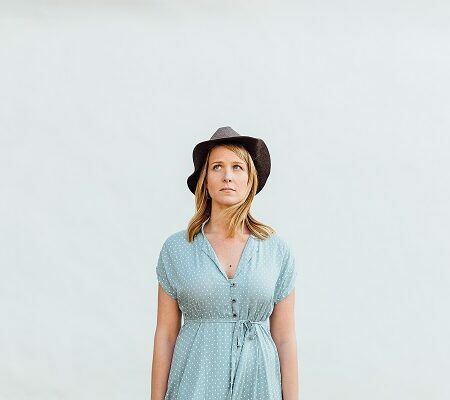 Putting little steps to monetizing your blog can sometimes bring great results. You do not need to know coding. Great tips! As a newbie, I sure appreciate posts like this. Thanks! Great tips in this post so many different ways to profit online. Thanks! Thanks for sharing! I want to start monetizing my blog but really need to put that extra time and effort in to see some results 🙂 I will check out what you have suggested to help! No problem. It does take a bit effort to see results but it is doable. These are really useful! Thank for sharing! thanks- full time income from my blog is my ultimate goal – reviewing your steps – i have a lot of work on but I’m glad to read that I’m on the right path. Thanks! You can do it for sure! Thank you for reading the blog! I just discovered last week there are different places besides social media to post your blog and I have been trying to work on that. Great article. Thank you. Yes they are so many different ways to promote a blog. Nice tips. I have lots of reading to do! Thanks! This is such an informative and helpful post! Thank you! Great ideas on how to monetize. I find the most success through sponsored posts. Your email list is crucial to your success for sure! Great tips. I definitely need to get organised and come up with a real plan. 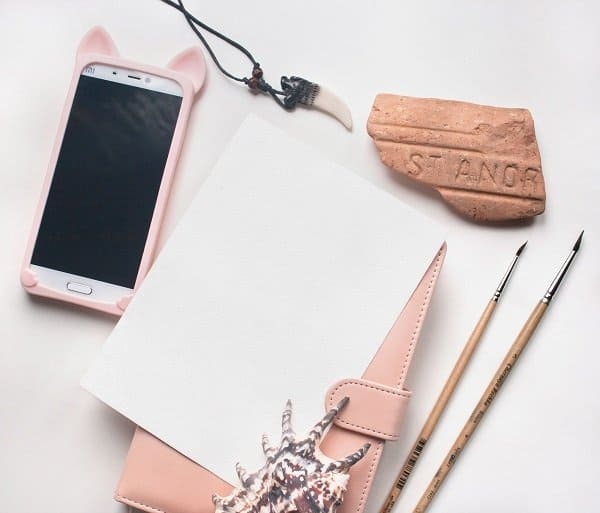 Planning is crucial to your success as a blogger for sure. This was fantastic and so useful to me! I’m saving to go back through and click on all you addition resources- thanks!!! Thanks for the wonderful tips! This is so informative. I’ll be making sure I pin this so I can keep myself accountable! Ha! loved this post. great info here. I’ve been so busy getting more traffic I havent been focusing on how to get money! Traffic is great. Put the traffic and your monetizing strategies together and you have a gold mine. Great tips. I’m a new blogger so always on the lookout for ways I can grow my blog. I’m not at a stage where I can monetize but hope that I’ll be one day. You can monetize at any stage. But do what is comfortable for you. These are all great tips! I need to be tweeting more apparently! Woohooo! I hope you find it helpful! Wow! Great info! Thanks so much for sharing! Amazing post! I’m definitely going to work through the list to grow my blog!